Ohio State CB Gareon Conley is a projected first-round pick. 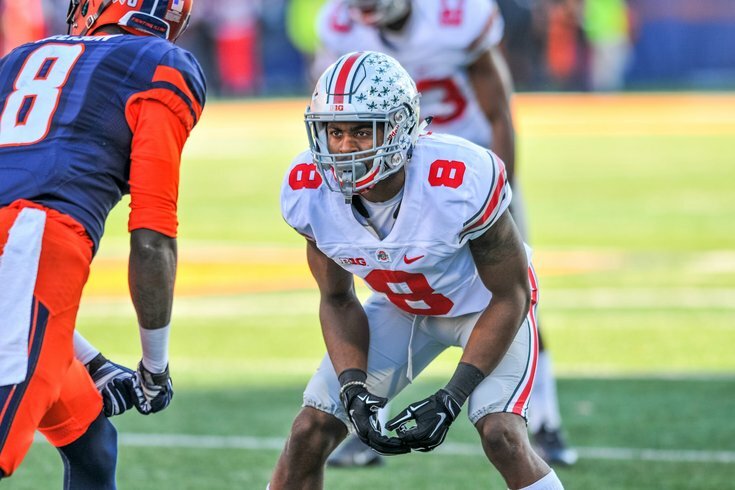 Gareon Conley, CB, Ohio State (6'0, 195): (3) Michigan at (2) Ohio State, 12:00 p.m. Allowing 30 completions on 90 targets is pretty good, right? Pat Elflein, C, Ohio State (6'2, 300): (3) Michigan at (2) Ohio State, 12:00 p.m.
At 6'2, 300, Elflein isn't the biggest guy, but he's mean and nasty. He also possesses the positional flexibility that Doug Pederson values. At Ohio State, Elflein played both guard spots in his sophomore and junior seasons, and center as a senior, where he is now. "You love offensive linemen that are versatile," explained Pederson during the 2016 pre-draft process. "You love to have tackles that can play left or right. You love to have guards that can also play center. The more you can have that flexibility with your guys up front, the more combinations and rotations you can have because not everyone is going to stay healthy for 16 games and you have to mix and match that. Guys that are athletic who can get out on the perimeter and run, aggressive up front, have a little, as they say, 'piss and vinegar' in their neck are guys that you look for. I think we have a good nucleus of that." This past offseason, the Eagles drafted Isaac Seumalo, a rare player who can play all five positions along the offensive line. The Eagles' fifth-round pick, OT Halapoulivaati Vaitai, started at right tackle in 2014 and left tackle in 2015 for TCU. The Eagles also brought in the versatile Stefen Wisniewski in free agency. Wisniewski has started both at guard and center during his time with the Jaguars and Raiders, but he is unlikely to return in 2017. As we've witnessed this season, the Eagles have had to replace two offensive line starters. The more positional versatility you have along your offensive line, the better equipped you are to weather the inevitable injuries (or suspensions, or whatever). Here's Elflein's game last year against Michigan, when he was at RG. As you can see, he can anchor in pass protection, and he opens up holes in the run game. Amara Darboh, WR, Michigan (6'1, 215): (3) Michigan at (2) Ohio State, 12:00 p.m.
Michigan has dominated their opponents in the majority of their games and, as a result, have an extremely lopsided run-to-pass ratio. On the season, they've run it 495 times and have attempted just 296 passes. That's 62.6 percent run plays. As a result, Michigan receivers don't exactly have eye-popping numbers. Their best receiver is probably Darboh, who leads the team with 44 catches for 758 yards (17.2 YPC) and 6 TDs. In 2015, Darboh was credited with eight drops on 93 targets, which is a concern, although he has been much better in 2016 (three drops on 66 targets). Also note that while Darboh struggled with drops at times in 2015 (which is the year the above video shows), he also made some spectacular catches. Chidobe Awuzie, CB, Colorado (5'11, 205): (22) Utah at (9) Colorado, 7:30 p.m.
Last offseason, the Eagles brought in Ron Brooks, a physical tackler at the slot corner spot who also contributes on special teams. Over the next two years, Brooks' cap numbers will be $2.1 million and $2.4 million. If Brooks cannot recover fully from a ruptured quadriceps tendon, the Eagles would save $1.6 million if they moved on from him next offseason. Most linebackers don't rack up 249 tackles over their college careers. Marquez White, CB, Florida State (6'0, 181): (15) Florida at (14) Florida State, 8:00 p.m. The former four-star recruit is shutting people down. On 316 coverage snaps, he has allowed only 104 yards this season. There were eleven cornerbacks that gave up more than 104 yards last week. That is good for first in the country on a per snap basis. He also ranks first in coverage snaps per reception at 31.6. Opposing quarterbacks have an NFL-style rating of 31.4 when White is targeted. In a Florida State secondary that has been absolutely loaded with great defensive backs, White is flying under the radar a bit, but he could be a good coverage corner at the next level.